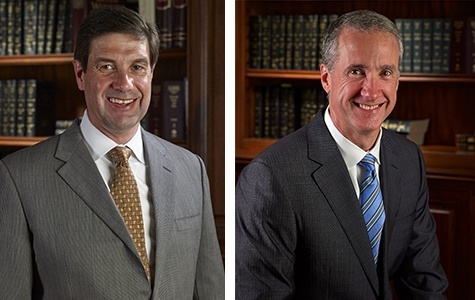 Rob Riley and Keith Jackson began practicing law at Riley & Jackson in 1999, but their connections go back much further. Both Rob and Keith grew up in Ashland, a town of about 1,800 near the Talladega National Forest. Rob’s father was a chicken farmer and cattle rancher, and Keith’s father has been a car dealer for 40 years. Both Rob and Keith attended the University of Alabama for their undergraduate studies. Rob served as the president of the Student Government Association. Keith was elected senator when he arrived a few years later. Rob and Keith each attended top law schools after graduating from the University of Alabama. Rob received his law degree from Yale University and a Master of Law degree in International Law from the University of Cambridge in England. Keith received his law degree from Emory University School of Law. Keith also studied international law abroad at the University College of London. Both Rob and Keith later became law school professors at the Birmingham School of Law while meeting the demands of their growing law practice. Rob also managed his father’s successful campaigns for U.S. Congress and later his two successful campaigns for Governor of Alabama. As they have grown their firm, Rob and Keith have remained committed to the principles they learned growing up in a small Alabama town and have drawn on the perspective they each have as sons of entrepreneurs familiar with the challenges faced by small businesses. As lawyers, both Rob and Keith have chosen to help people and businesses at the time they need it most. By representing individuals in cases involving wrongful death, catastrophic personal injury, securities claims, and nursing home and medical malpractice, the firm furthers its purpose of serving those in need. When advocating on behalf of businesses that are involved in litigation and commercial disputes, our lawyers call on decades of experience with contractual and litigation issues unique to small businesses. The lawyers at Riley & Jackson also have deep experience successfully representing local governments. The firm filed these cases to assist counties and municipalities in recovering revenue lost because of the wrongful conduct of others. When necessary, counties and cities are able to turn to the courts to address many wrongs to make sure that taxpayers are not carrying the burden of paying for bad acts that financially harm the county, city, or state. Over the years, the firm has grown to include other lawyers who share the goals established by Rob and Keith of public service and client advocacy. Kallie Lunsford has extensive experience representing individuals and businesses in securities arbitrations, BP claim submissions, and defective medical device litigation. Jay Murrill handles a variety of governmental matters as well as civil and commercial litigation. Jeremiah Mosley represents individuals in all types of injury litigation. For more information about our Birmingham law firm or to schedule an initial consultation with our attorneys, call 205-879-5000 or send us an e-mail via this website. We serve clients throughout the country.